We arrived at 7pm on a Thursday and a number of tables were already taken. One of the young staff looking in our direction sprung to his feet when he saw us at the door and hurried to get to us. 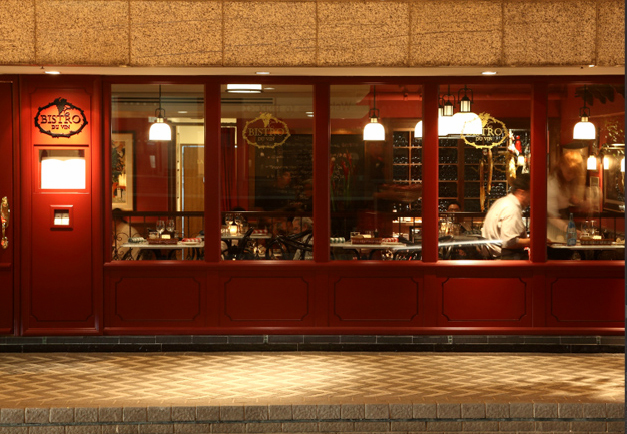 Stepping into the restaurant, we noticed how cosy the place was with orange lights beaming down cheerfully and wait staff who were approachable, alert and dynamic. We promptly placed our order for a foie gras terrine, a baked Burgundian escargots with garlic herb butter, a slow-cooked lamb shank, a veal blanquette and a truffled mashed potato. 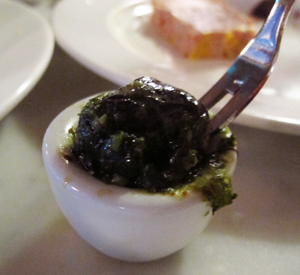 The terrine and the escargots came fairly quickly and we wasted no time tucking in. 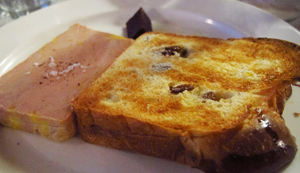 The terrine came with a slice of brioche that was done with plump raisins and had a refreshing tangy orange flavour to it. I took a wee bit of the terrine to get a feel of how it tastes on its own. Even with that wee bit, I could taste its rich robust flavour that was a little too overwhelming for me. I cut the slice of brioche into four, picked up a careful portion of the terrine and spread it thinly on the brioche. The brioche dispersed the rich flavour gently so it doesn't drown your palate. The orange zesty flavour from the brioche also made it easier for me. One slice of the brioche was good for the two of us as we wanted to keep our appetite for the rest of the meal. My colleague likes her food piping hot and the escargots (six of them) met her mark for that. Snails don't really have a powerful flavour of their own, what makes the good ones great is the sauce. 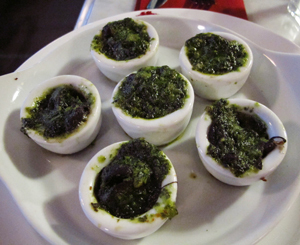 The one we had was done in traditional garlic herb butter which was easy to eat and the escargots were soft with a gentle bite. After we were done with the appetizers, the two main course reached us at the same time in brightly coloured pots from Le Creuset. The wait staff lifted the lids off the pots at the table and my colleague was very pleased as she saw how piping hot the food was. The lamb shank (served with crushed potato) was tender and its meat while very much intact, came off from the bone with a little tugging from our forks. It had a very mild and gentle "lamby" taste that was acceptable for me. The sauce, made with tomato paste and red wine, that came with the dish made it even more palatable. In the pot also was several cherry tomatoes confit that burst with plenty of sweet savory juices when you sink your teeth into it. The crushed potato was extremely delightful as well due to the lovely extra virgin olive oil that went into its making. 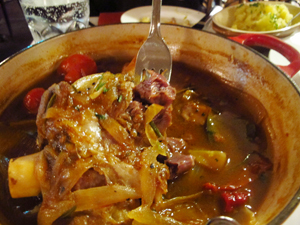 Next was the veal blanquette (served with white rice) prepared with bobby veal shank. Its creamy sauce was smooth and rich yet doesn't drown you out. I've cooked pasta in creamy sauce before and I felt so heavy and sick after a few spoonfuls of the pasta. 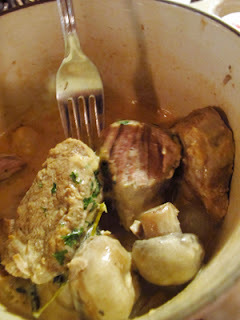 But it wasn't the case for the veal blanquette at Bistro du vin. If not for the fear of putting on weight, I probably could have dipped some bread into the sauce and finished every bit of it! The meat was tender to bite and finished with a coarser feel on the tongue. The mushrooms, being extremely porous, took in a good amount of flavour and gravy. In fact, I may just attempt to do a mushroom blanquette! We also had the truffle mashed potato that was buttery and fragrant. To get the most kick out of it, have it while it's hot. For dessert, my colleague had the crème brûlée while I had the hazelnut home-made ice-cream. Again, the crème brûlée was great! It had a mildly burnt crust and was not overly sweet, I probably ate 40% of it while my colleague had 60% (yeah, I ate her dessert). That said, the hazelnut ice-cream I asked for was not to be neglected. I cleaned the ice-cream bowl so well that I think they need not have to put it through the dishwasher at all. Perhaps being newly in love makes everything great: trains don't seem as crowded, buses seem to arrive pretty much on-time and suddenly "unloveable" people are rather "loveable" now. After footing the bill, I asked if I could meet with Chef Dalton. He came out from the kitchen and we had a pleasant chat. He shared openly about his family and how his daughter would wait for him to come home at night. Despite preparing food all day in the restaurant, he makes it a point to cook for his family at least once a week, in particular, Asian soups (Chef Dalton is from Malaysia). Come to think of it, perhaps, I should have gotten some recipes from him. If you have any recipes for making Asian soups, please share them with me on our Facebook page! Chef Dalton recommended the pink tiramisu that the restaurant had on special that day but it was a shame that both of us had no more room for any more sweets! Nonetheless, I don't rule out the possibility of returning to Bistro du vin for its family-style French food, desserts and to chat with the chef. Huber's Butchery paid for its meal at the eatery mentioned here.